It's perhaps ironic that Yamaha, the original proponent of home cinema and multichannel sound, came to the Blu-ray party a little late in the day. But the brand has been playing catch-up fast. The BD-S667 reviewed here is one of four players now available at Yamaha dealers nationwide. It sits below the lookalike BD-S1067, which adds compatibility with Super Audio CD and DVD Audio discs to the mix. While the BD-S667 doesn't have the heavyweight build quality of a BD player with specialist hi-fi lineage, it's certainly as solid (if not as thin) as mainstream models from the market leaders. The deck's user interface has that unmistakable Shenzen aesthetic; which is to say it's not particularly pretty, but as you page through the various set-up parameters, you can take comfort in the options available. And if these look too daunting, there's a simple set-up wizard that makes life easy for complete technophobes. Adding some bespoke class is the standard hi-res Yamaha skin, but this is lost when you hit the player's Home button. The unit itself is a cosmetic match for the brand's new season AV receivers, but looks a little bland in isolation. The front panel sports one of two USB ports available. It can be used for BD Live storage (there is no internal memory on board, a bit stingy given the ticket price) or multimedia file playback. The disc transport itself is centrally located to improve stability and there's a selection of control buttons ranged right. Our review sample came in anonymous black, but you can order different finishes such as Titan (aka Grey) and Silver. Rear side connections include an HDMI output, component video and phono stereo, optical and coaxial digital audio, Ethernet and a second USB port. It's good to see component included. These analogue HD outputs are a dying breed, yet offer system builders some valuable options. Finally, there's a set of 3.5mm remote control jacks. These are specifically provided to integrate with that matching Yamaha receiver, thereby allowing the player to be part of the AVR's SCENE functionality. When the player is part of the SCENE (sic), a single button press will turn on both the Yamaha AVR and BD player, as well as selecting the predetermined sound mode, input and volume setting. It's a much simpler alternative to struggling with macros on a learning remote. Beneath the hood lurks a 92kHz/24-bit audio DAC plus x.v.Colour and Deep Colour compatibility. The former is useful, the latter less so. This is a deck with network entertainment very much in mind. DLNA compatibility allows the BD-S667 to interrogate your home network for compatible NAS and PC devices (you may need to install a DLNA server like Twonky Media on your PC to share files). These are then gathered on the Home screen where you can drill down into folders and rummage for content. Alternatively, you can play media straight from a USB Flash drive, and the good news is that file support is excellent. Officially sanctioned formats comprise DivX HD, AVCHD, WMV, JPEG (HD), MP3 and WMA. I teased the player with my usual ragtag folder of files, which in the past has befuddled many a media player. The Yamaha was not intimidated and aced all my tests. I had no problem with an AVI DVD rip of a Japanese horror film that has in the past sent many a big name sprawling into the digital dirt. Even more impressively, the player found and played the accompanying .srt subtitle file. The deck also smiled kindly upon MKV-wrapped HD downloads as well as my MP4 video clips. This functionality is a big part of the player's appeal. The ability to act as a content hub is increasingly what I expect of a Blu-ray deck. It should be noted that two samples of the S667 were supplied for review, and both displayed a curious fault from the box. When connected to our network via Ethernet, they locked up and became unusable. It took a firmware update (from v1.5 to v1.7) implemented (very slowly) via USB to fix this. Unsurprisingly, there are plenty of features that the BD-S667 doesn't have. The most obvious unticked box is 3D. However, I suspect that for many potential buyers this will not be too much of a concern, and it's not as if Yamaha has a 3DTV to support either. The other noticeable omission is any form of online content portal, so the BD-S667 can't offer niceties such as YouTube, BBC iPlayer, European sports and news providers and weirdo sleaze from DailyMotion. Given that your next TV will probably bundle this stuff, this isn't a biggie, either. When it comes to video quality I have few complaints. I auditioned the deck with a selection of rather challenging platters, including a test disc from top Japanese authoring house, QTec, and was left satisfied. In terms of video clarity, the BD-S667 performs well. There is a high level of detail extracted from both DVDs and Blu-ray, but noise is kept low, allowing plenty of shadow detail to break cover when required. Take care with the setup though. In the picture menu ensure that you do not select PAL as the default output for the player. The correct setting is Multi. If you do select PAL, the deck will make a horrendous, juddery job of squeezing 60Hz Blu-ray material into 50Hz. 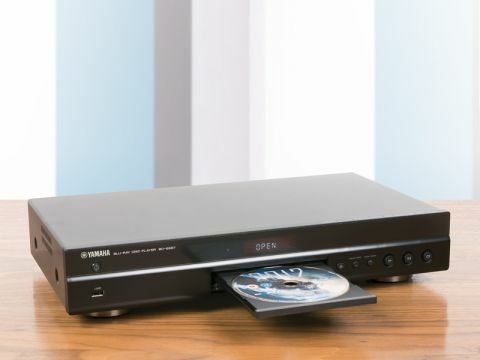 You might expect any Yamaha branded BD player to edge ahead of the rest when it comes to CD playback, and you wouldn't be wrong. Analogue audio jitter was measured by our Tech labs at 196ps, which is an excellent figure and better than many other Blu-ray decks. With that in mind, stereophiles shouldn't be scared of playing CDs through the BD-S667's analogue outputs. Multichannel audio over HDMI is another one of the deck's strong points. The 2L Blu-ray audio release Flute Mystery is a wonderful audition piece. It's an expansive, dynamic audio recording, featuring Emily Beynon and the Philharmonia Orchestra, presented in both a DTS HD Master Audio multichannel mix and LPCM two-channel version. When you select the DTS-HD Master Audio option and bitstream out, the player delegates playback quality to the decoding electronics. I left my resident Pioneer Susano AVR to do the number-crunching and it sounded fabulous. The LPCM two-channel mode is a little more revealing; I'm tempted to say it had the edge in quality (although I was expecting it to be significantly better), but I missed the immersive quality of the DTS 5.1 mix. In use, disc loading time is only average. It took some 47 seconds to get our standard test BD playing onscreen from a Tray Close command. Power consumption is pleasingly low, however, both when idling and playing. Overall, the BD-S667 is a competent if expensive Blu-ray deck, that makes the most sense when partnered with a matching AVR. Perhaps surprisingly, the feature that ended up exciting me the most was its multimedia support. The fact that it breezed through my test files moves it ahead of many competing decks. With that in mind, it's worth considering, although I would advocate spending a little more to secure the SACD and DVD-A support of its bigger brother.